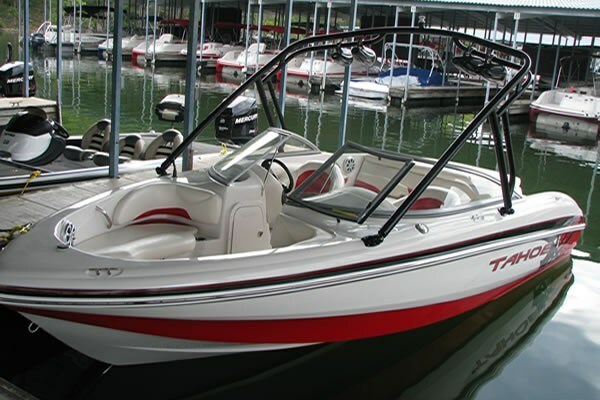 Tahoe, one of five brands of the Tracker Marine Group (the other four being Tracker, Sun Tracker, Nitro, and Mako), offers fourteen models of fibreglass Ski & Fish, Runabouts, and Deck boats for 2011, of which the Q8 SSi is its flagship runabout model. Boatdealers.ca recently had a preview peek and water test of this exciting new model equipped with the optional wakeboard tower with built-in speakers and the largest engine option – MerCruiser’s 320 hp MX 6.2 MPI (377 MAG) with a Bravo One sterndrive turning a 21-pitch stainless steel Vengeance propeller. Does this boat move! The hand-laid fibreglass PowerGlide™ deep-vee hull design with Hydrostep® lifting strakes accelerated instantly onto plane and performed flawlessly through high speed manoeuvres showing off its flexibility for all watersports possibilities. Tahoe’s built-in fibreglass stringer system provided the backbone strength and rigidity for a solid ride with no shaking or banging whatsoever even through the rough stuff. Even the wakeboard tower remained perfectly rigid and totally rattle-free. This is one impressive family fun runabout. A large, full-width integrated swim platform with top-mounted, fold-down, telescoping, stainless steel swim ladder offers ready water access while two insulated storage/cooler compartments built into this platform allow beverages or smaller watersports accessories to be close at hand. A large aft sculpted and padded sundeck over the engine compartment allows two to soak up some rays while the comfortable aft couch has a slide-out portside jump seat cushion with storage below and a huge, finished, integrated, insulated cooler/storage location beneath the couch. Driver and passenger seats are both supportive and comfortable adjustable swivel buckets with a flip-up bolster on the driver’s side bucket. 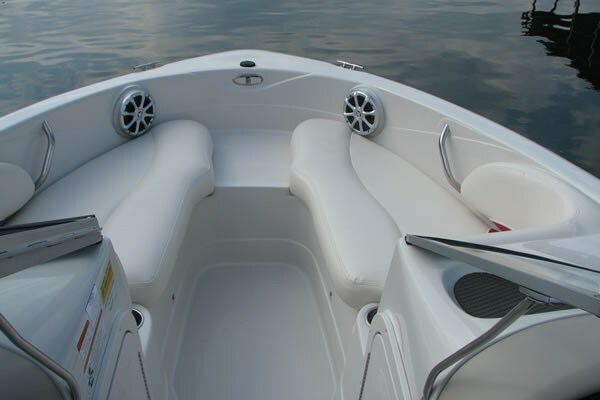 Both bow lounges with padded backrests remove to reveal even more insulated and draining coolers/storage below. Another insulated and drained ice-chest/cooler/storage area is found in the passenger console while a huge wakeboard/water ski storage compartment is centrally located within the non-skid fibreglass floor of the Q8 SSi. Storage space seems to be everywhere you look on this boat. A curved, wrap-around, aluminum-framed windshield with centre walk-thru provides ample wind protection, even for a tall driver and the helm is ergonomically well designed and readily comprehensible. All of the normal sterndrive gauges and switches are present and easily accessed and visible behind the sport steering wheel. A compass and Lowrance® digital depth sounder complete the standard instrument package. 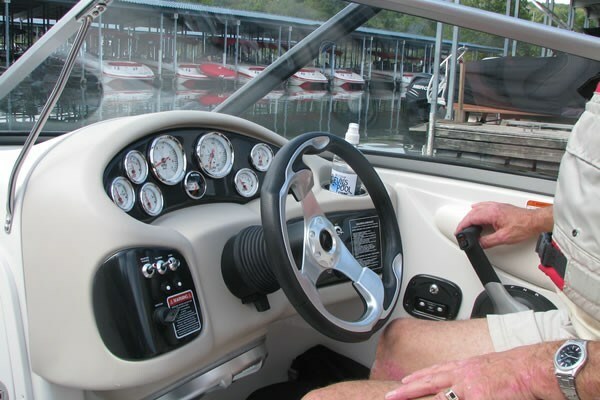 MerCruiser engine controls are comfortably user-friendly and right at hand. An AM/FM/CD stereo with MP3 jack, Serius Satellite Radio capability, and four directional speakers provides the standard sound system. High-power optional systems are available. Driving the Q8 SSi is a relaxing treat and you’ll want to spend all day, every day at its controls. Wiping the smile off your face at the end of the day will be impossible with this boat. Out on the water, the Q8 SSi was loads of fun and totally predictable at all speeds and in all conditions. And it was quick too! A quiet, economical, family cruising-enjoy-the-scenery speed was found to be about 22 mph at 2600 RPM. A little nudge on the throttle brought 28 mph at 3000 RPM, while 4000 RPM jumped us to 42 mph. WOT (Wide Open Throttle) at 5400 RPM produced a thrilling 58 mph. Do you need all this speed and performance in a family runabout? Probably not. But is it fun? You bet. 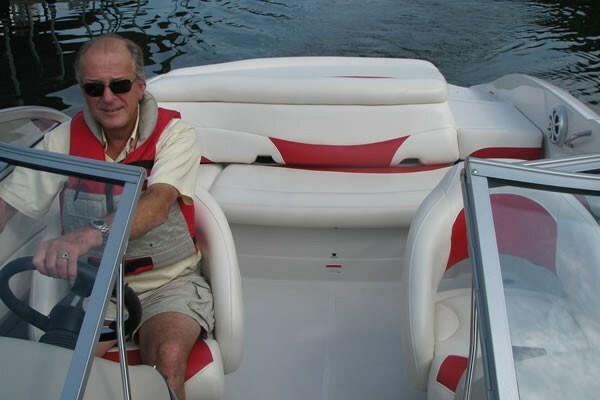 You might choose one of the many optional smaller and less expensive MerCruiser sterndrive packages and they will most likely satisfy every boating requirement you may have and will still put that huge smile on your face. But if you have the budget, consider this package as tested. This one is guaranteed to thrill. And you can always go slower anytime you want to. Being part of the Tracker family, the Tahoe Q8 SSi comes as a complete package with its own custom, factory-matched, colour-coordinated, powder-coated, tandem-axle, drive-on trailer with surge disc brakes and a swing-away tongue and tongue jack. The boat offers five choices of standard colour schemes, one just right for you, and optional graphics packages are available to personalize it still more. If you’re into family fun and watersports activities, this Tahoe is one thoroughly enjoyable experience and very tough to beat.